TROM | World Gap | ")); // smoothen transition for text elements only $('style#global').remove(); $('html').append($("
Recently, Brazil (a tribe among other tribes) hosted an event called “The World Cup” that many millions of humans are very interested in, more interested than their own life game. Some humans call this event ‘a football game’ (or ‘soccer’ for US citizens). For other alien life forms who are not familiar with this particular human culture, it is something that around 22 humans participate in, and millions watch. They play 11 against 11 and chase a ball for 90 minutes. The goal is ‘to goal’ (to push/kick/’score’ the ball into the opposite team’s net). This entirely complicated and mind challenging game requires, it seems, many stadiums where spectators sit and watch the ‘talented’ 22 others play. Some of the spectators have binoculars because they are so far away from the 22 players that they cannot tell where the ball is or which one is their favorite team. All in all, this event exists purely for watching a few people play with a ball, all the while following some simple and ancient rules. If you were an alien, you would not be able to tell the difference between any 2 football (soccer) matches, except the colors on the team’s equipment. They bring nothing new (relevant) and nothing can be learned from these games by anyone, let alone the fans. The entire excitement surrounding such events is not a surprise if you know a thing or two about human behavior which, in short, is mainly a copy-paste behavior from whatever is more prevalent in their own culture. If your friends, father, and everyone you see on TV are interested in football, then you probably will be as well. The awful part of all this is that the human race spends a ton of energy and resources for these mindless events. Even if you don’t consider them ‘mindless’, it is difficult to disagree with me that those resources and energy could be spent in a better way. Brazil spent $14 billion for this one month event, while ‘hosting’ 20 million homeless citizens of their own tribe. They could have provided their tribe with 100% renewable energy, built 3 million houses, 1,400 hospitals with a total of 1,400,000 beds (3 times more than Brazil currently has), or they could have invested in advanced scientific and technology research for 3 years, and much more. Choosing one of those options would have been much better for their citizens, yet they didn’t. A handful of people are making these decisions in the name of, or for, millions of others. How humans could accept such a system is quite ‘fantastic’ to me. The Brazil example is not an exception; when it comes to such sport events, this is the rule. 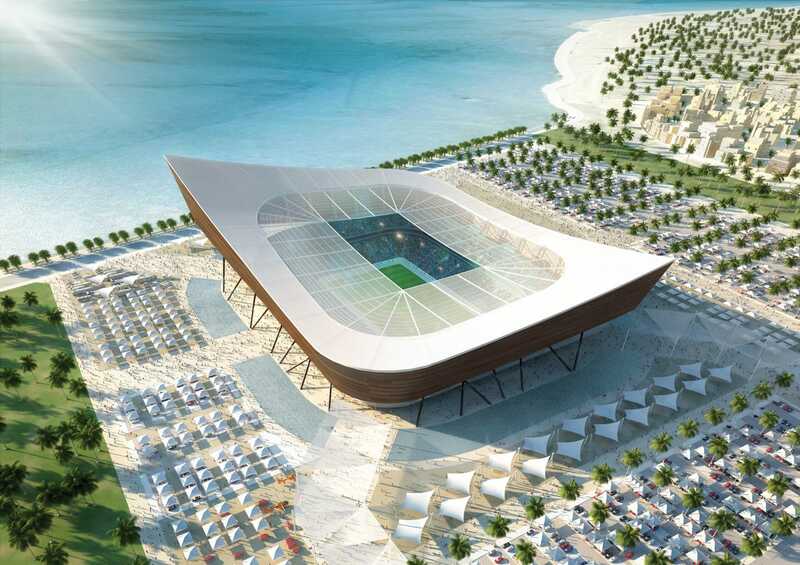 In Qatar, another tribe on planet Earth, they are preparing for the 2022 World Cup. First of all, 2022 seems light years away, considering the fast evolution of technology and knowledge. By 2022, we might well be in a situation where 80% or more of all jobs have been replaced by robots; the world is very likely to look quite different from today. Nevertheless, people who are organizing the World Cup seem to think that the world will never change and perhaps the World Cup will be hosted in 2354 or the year 3000, on Mars or other planets. The fabulous thing about this particular World Cup is how much money (meaning resources and human labor) these people will use. For Qatar, it is not $14 billion as in the case of Brazil. No! It is $200 billion! If you haven’t noticed yet, the large structure in this picture is not a big pile of apartments for people to live in, nor is it a shelter in case of disasters, or even a nature park to be enjoyed by all. It’s just another stadium out of so many millions in the world; a stadium… to play football there only a couple of times a year. The Qatar tribe plans to build 12 similar resource and energy hungry structures by 2022. These sums of money are beyond our grasp, but what is even more painful is that it’s estimated that 1 worker dies every two days while working on Qatar’s World Cup preparations. That’s one every two days! Mostly, they are dying from cardiac arrest caused by the working conditions and extreme heat, and some of them are only 28 years old. It is estimated that by the time Qatar puts on the 2022 World Cup, 4000 workers will have died. If that is not a form of slavery, then what is!? The Olympic Games, another major sporting event where humans from many tribes compete for fame and money (it seems there is nothing else to gain from it), uses up huge amounts of resources and energy on the overall construction and logistics, as well as on organizing and promoting these events. As an example, the Russian tribe organized the 2014 Winter Olympics at a cost of $50 billion, while being in the same situation as Brazil when it comes to the poor people in their tribe. 5 million people are homeless in Russia and many others are extremely poor. There have been many controversies around this event, such as: “exploitation of workers engaged in Olympic construction; allegations of the illegal dumping of construction waste threatening residents' health and safety; evictions and displacement of residents to make way for Olympic venues; economic issues; and harassment of environmental and human rights activists and journalists who criticise Olympic preparations or the government's anti-LGBT policies” (source). The examples shown here are just a small sampling. In almost each case, there have been tremendous amounts of money spent (resources and energy) and many controversies around these events: slavery, corruption, human trafficking, crimes, and more. It is quite a challenge to provide links to all such cases, but here are some articles exposing some of the scandals over the years: 1, 2, 3, 4, 5. You can do your own research on this to gain a stronger sense of how much human suffering and waste of resources and energy such sporting events bring. Just use any of the search engines out there in the vast internet to read through thousands of articles on these issues. Although some may say that these events bring an upgrading to the tribe’s infrastructure, such as transportation, that is sad even if true, because it implies that you need such events to bring about such changes. The reality might not even be that. In any case, the stadiums and other facilities they build for such events frequently end up in ruin. I know that so many people love such events, although they only participate by observing, but there is too much evidence that these events bring a lot of damage and despair to many human beings and that there is a huge waste of resources and energy. Moreover, these events promote nationalism and competition which separates people. Tribalism on a planet can only lead to conflicts. The fact is, there have been many leaders and regulations for such events over the years, and it seems that there has been no significant change. This can only lead us to think that, again, as in other situations we have presented in past articles, it is not the people or the laws that are the problem, it is the entire monetary game we play which leaves room for such situations and even encourages corruptions, conflicts, and crimes. If people are poor, of course they will accept poor working conditions to make some money. They are desperate. Of course a team might want to win such competitions by any means when there is so much money involved. However, money is not the only factor that leads to these harmful situations. Competition may also be a problem, although both competition and money may actually influence each other, as they tend to go hand-in-hand. There can be sport without competition, and there can be some sort of what me might call ‘competition’ without tribalism and negative results. There is even a book about cooperative games that sounds promising. We will discuss the notions of sports and competition in more detail in future articles.